Even the big guys have had a tough time selling to millennials, who generally shun brand loyalty. The push toward craft brewing doesn't help, either. That's one word that describes the beer industry these days. Big brewers have lately ceded momentum and market share as smaller craft operations and the wine and spirits industries grow in popularity. The flattened pace of growth persists even as this weekend comes a top beer-drinking holiday: Super Bowl LII. In the year ended Jan. 28, 2017, beer sales grew only 2.1%. While it's still growth, it's the slowest pace of expansion in the past four years, according to Nielsen Ratings analysts in the 2017 report State of the U.S. Beer Market. Overall beer sales were static in 2016, according to a report from the Brewers Association. At the same time, craft brewer sales grew at a 6.2% rate by volume, reaching 12.3% of the overall beer market volume that year. Retail dollar sales of craft brews increased 10% in 2016, the association found, to $23.5 billion, or nearly 22% of the U.S. beer market's total dollar value. So what's making Americans pull back from drinking beer the way they used to? Turns out, U.S. millennials have a hand. "The millennial set is less loyal," Susquehanna senior equity analyst Pablo Zuanic told TheStreet. "They'll go between wine, spirits and beer more than older generations." Remember how Pops would only drink Coors and Mom was strictly an Amstel fan? That's not the case with millennials. They're more likely to try new products and less likely to establish real brand loyalty. Plus, they drink a lot more wine and spirits than older generations. 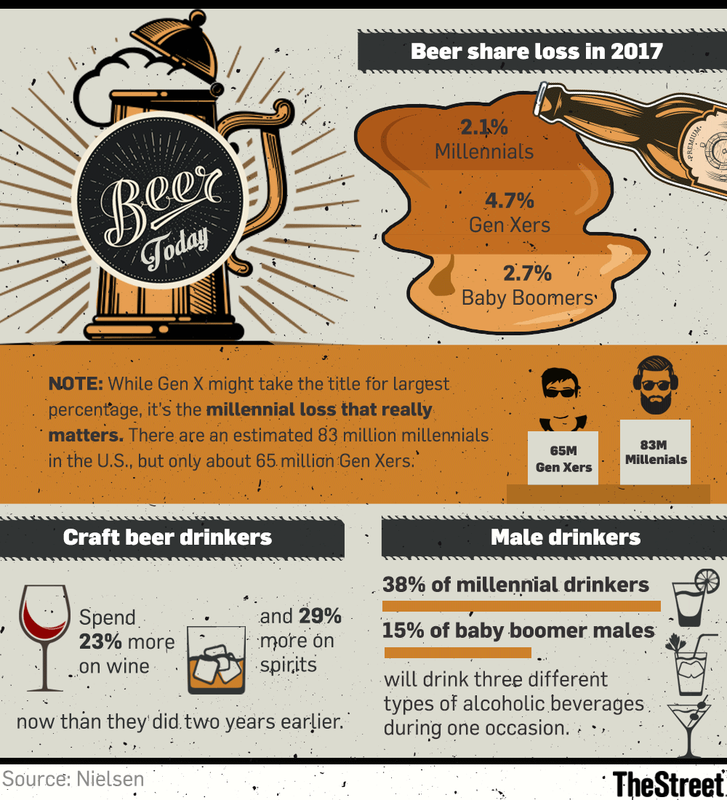 According to Nielsen, beer share loss last year totaled 2.1% among millennials, 4.7% among Gen Xers and 2.7% among baby boomers. While Gen X takes the title for largest percentage, it's the millennial loss that really counts. Millennials total an estimated 83 million, compared with 65 million Gen Xers. Craft beer drinkers, a crowd which has grown substantially in the past five years, are also more open to trying other beverages, Nielsen found. According to its estimates, craft beer drinkers spend 23% more on wine and 29% more on spirits than they did two years earlier. This beverage "promiscuity," as Nielsen bills it, means 38% of millennial males will drink three different types of alcoholic beverages during one occasion. That figure is only 15% for their baby boomer counterparts. "From our point of view the health of the industry is pretty decent," Zuanic said. The industry has been largely flat lately, a trend expected to last well into 2018. That's a step up, though, from 2017, when Zuanic said volumes were negative across some industry aspects. 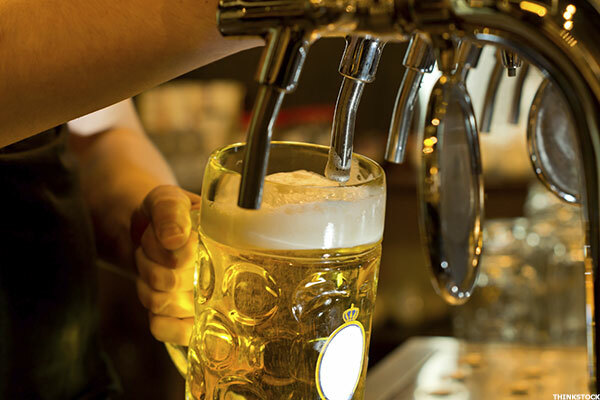 While large brewers, including Anheuser-Busch InBev (BUD and Molson Coors Brewing Co. (TAP - Get Report) , are losing share to craft brewers, they're still largely profitable, Zuanic said. Yet the threat of smaller craft competitors has driven the larger companies into a spate of acquisitions. In November 2016, AB InBev acquired Texas-based Karbach Brewing Co. for an undisclosed amount. The big beer brewer then bought North Carolina-based Wicked Weed Brewing in May. Wicked Weed marked the company's 10th craft brewer acquisition. In November 2017, Molson Coors purchased Quebec-based Trou du Diable craft brewer. It's not all bad news for brewers this Super Bowl: Minneapolis, the locale of this year's big game, is the seventh-biggest beer drinking market in the U.S., Nielsen estimated, behind No. 1 Milwaukee. About 49% of the metro population of Minneapolis has consumed a beer in the past 30 days.